"You're getting to be quite a little dish at that, you know that?" Before there was auteur theory, there was the Capra touch. Movies with Frank Capra's name above the title are unmistakable, combining a gee-whiz optimism and a healthy dollop of can-do spirit with a gimlet eye on the hard realities of the time, especially in the nadir of the Depression; sometimes his pictures have been dismissed as overly sentimental, as nothing more than Capra corn, but there's a real darkness clearly in play in most of his work. It's not unusual to see a Capra hero close to suicide (Meet John Doe, It's a Wonderful Life) or otherwise at the end of his tether (Mr. Deeds Goes to Town, Mr. Smith Goes to Washington), and Capra's popularity is testament to the deep nerve he struck in his contemporary audiences. 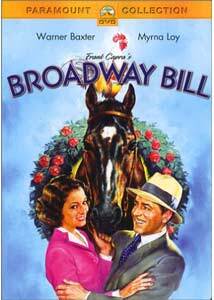 Broadway Bill may not be a Capra picture of the highest order, but it's still got its charms; it was made just after the director's Oscar-sweeping It Happened One Night, and later disappeared for decades, when Capra re-made his movie as Riding High. Don't let the name fool you�this is no Tin Pan Alley story, but rather a story with a title character that favors hay and carrots: he's a horse. Owning said horse is Dan Brooks (Warner Baxter), who dreams of having Bill ride to greatness; Dan has married well, but he's learned first hand that money isn't everything. His bride is Margaret Higgins, of the Higginsville Higginses; Dan's father-in-law, the stout J. L., owns everything and everyone in town, and since he has no sons, he's determined to get his four daughters married off, and to use his quartet of sons-in-law as his executive vice presidents. Dan has drawn the assignment of running a box-making business, which is about as dull as it sounds�he just wants to be out in the stable, getting Bill ready for the Imperial Derby. Finally, he's had enough of getting pushed around by J.L., and does exactly that�he lights out for the track, and Margaret, a Higgins through and through, does not follow. Much more interested in Dan is Margaret's remaining unmarried sister, Alice (Myrna Loy), who hasn't confessed it to anyone, but is clearly head over heels in love with her brother-in-law. Will true love prevail at the track? Will Bill race up to his potential in the Imperial Derby? Will Dan get to live a manly life of freedom, instead of one leaving him in golden handcuffs, led around by his wife's daddy? It's a Capra picture, so you can probably figure out the answers to those questions. This sure is a fun ride, though, principally because it's a fairy tale; and no fairy tale is complete without a good amount of danger. This isn't a movie that shies away from the economic realities of its audiences; no doubt Thirties picturegoers went to the movies to escape the hardships all around them, but they knew that not everything was candy canes and lollipops, either. (These were the years of Seabiscuit's greatest glory, too, so the horse who came from nowhere to lick the stuffed shirts probably had some resonance, too.) Baxter and Loy are smart and snappy in the leads, as are all of Capra's supporting cast, including Margaret Hamilton, as a nasty rooming house landlady affectionately called Vinegar Puss. (And your little dog, too.) The only bit that might make contemporary audiences a bit uncomfortable is Dan's Stepin Fetchit-style companion named Whitey, an African American whom the other characters routinely refer to as "the boy." Image Transfer Review: There are many, many scratches on the print, and the blacks tend to be gooey and faded. The transfer itself is only adequate; the movie just doesn't look all that good. Audio Transfer Review: There's a whole lot of hiss and crackle, which is typical of DVD transfers for movies from this period; still, much of the dialogue is muffled, and you may find yourself reaching for the remote to turn on the subtitles, the best way to make sure you get all of Riskin's bon bons. Extras Review: Frank Capra Jr. provides an introduction (05m:02s) to the picture, giving a brief overview of his father's career, and a few details about the feature; the budget for the remake was so low, for instance, that the director used the racing scenes from this 1934 version for its 1950 incarnation. A solid Frank Capra picture that may not stand up with his best work, Broadway Bill still has a whole lot of charm, a smart script and a swell cast.